When I hear the word "yacht," it's hard not to paint the most romantic of pictures in my mind: an atmosphere genteel, pampering and sophisticated. But if your experiences are anything like mine, your image of a barge is of a low, flat, graceless vessel piled high with ore or full to the gunwales with oil. 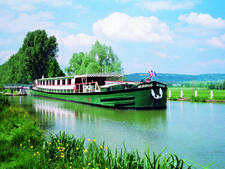 My cruise aboard French Country Waterways' elegant barge, Adrienne, has since disabused me of that prejudice. It's a shame that there is no single word or two-word phrase that adequately describes these vessels that French Country Waterways sails on the rivers and canals of France. When I challenged my fellow passengers aboard Adrienne, French Country Waterways' most recently launched barge, to come up with suggestions for a fitting appellation, what I got wasn't a moniker, it was a complete descriptive paragraph, something along the lines of "Adrienne is a flat-bottomed, rugged-looking, industrial shell hiding a charming little four-star hotel on the inside." That's a mouthful. But it's right on target. An entire class of vessels like Adrienne is designed to travel the inland waterways of Europe. They are low-slung to pass under centuries-old bridges while drawing as little as four feet of water in order to negotiate shallow stretches, especially in canals which may have been dug as long as 400 years ago and not dredged since. Their length and beam are dictated by the measurements of the many locks along the waterways, resulting in a shape much longer than wide, with flat bottoms to reduce draft. In short, on the outside they are literally barges (with the possible exception of sundecks), and what is on the inside can be strikingly opulent. 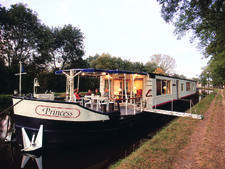 In the case of Adrienne, within the barge-like exterior hides the ambiance of an 18th century French country inn, transporting up to 12 pampered passengers in luxury and style through the canals of the Upper Loire Valley, part of France's 3,000 kilometers (about 1800 miles) of navigable rivers and canals. In an era before the advent of railroads, these waterways provided transportation for people and cargo throughout the country. They are still occasionally used for the movement of cargo, but mainly by luxury hotel barges such as Adrienne, and private watercraft from all over Western Europe traveling within France's borders or transiting to the North Sea, Atlantic or Mediterranean. Essential to the navigability of the canals is a system of locks. If supertankers and mega-liners that barely fit into the Panama Canal's locks are deemed "Panamax," Adrienne could be called "Francomax," as it just barely fits into the Loire's locks, with literally inches to spare on either side. Entering a lock reminded me of trying to get a Humvee into a compact car parking space, and most times we scraped Adrienne's solid black sides. I asked how often they needed to repaint the hull. "Every week," was the answer. There is a world of difference between the full-tilt energy of Paris and the timelessness of provincial France found along the rivers and canals that French Country Waterways' barges travel. Since Paris is the rendezvous point for all French Country Waterways voyages, it would be a shame not to spend at least a day or two exploring the "City of Light" before embarking on the voyage itself. In our case the meeting point was at the four-star Le Meurice Hotel, across the street from the Tuileries Gardens and two blocks from the Louvre. French Country Waterways can arrange discounted rates at Le Meurice for its passengers, and we thoroughly enjoyed our two days in Paris before the sailing. Our actual six-night cruise began with a 90-minute transfer from Le Meurice to Nemours, the put-in point where Adrienne was moored. While waiting for the transfer we got a chance to meet our fellow passengers (a grand total of three other couples!). Shortly after, Glen, a Brit now living in France, approached us and introduced himself. Glen was Adrienne's onboard tour guide, as well as driver extraordinaire of French Country Waterways' comfortable Mercedes van, used for transporting passengers from Paris to the cruise's departure point and from the endpoint to Paris at the conclusion. Along the way, it's used to reach points of interest ashore that are beyond walking distance from the barge's tie-up point. Adrienne follows a yachting type of itinerary -- mooring overnight and sailing during daylight hours. Our first night onboard was occupied with settling in, meeting the six-person crew, and enjoying our first onboard dinner. After dinner we took the opportunity to stroll the nearby neighborhoods of Nemours (ancestral home of the DuPont family) and watch the flight of a flock of hot air balloons. Next morning we departed, beginning the pastoral rhythm that our lives would follow for the next six days. Time and scenery float slowly by as Adrienne glides through the mirror-smooth canals at a pace that could be overtaken by an average kayaker -- hardly faster than a walk. In fact, passengers can elect to either walk or bicycle between locks, departing Adrienne at one lock and reboarding at a later one. In between, they can follow the towpath, once used by horses or oxen to tow barges before the introduction of motorized watercraft. The paths skirt forests, farmland and the occasional small village. For those whose experience with locks is limited to the Panama Canal, the scale and informality of these will come as a shock. Often the boat's deckhand operates the lock, with or without the assistance of the local lockmaster, using hand cranks to open and close the lock gates and to open the sluices to fill or drain the lock chamber, depending on whether the vessel is climbing or descending through the lock system. Passengers, on request, can even participate in the process, working off a bit of the three French meals, six types of cheese and four varieties of wine offered up daily. 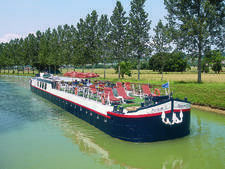 French Country Waterways voyages are nearly 100 percent all-inclusive. In addition to meals, all beverages -- including wine and spirits -- as well as shore excursions are offered without additional charge. One exception is an optional hot-air balloon ride, which is offered at 220 euros (at about $280 U.S. per person, payable by cash or credit card). 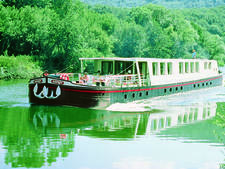 French Country Waterways is designed for, and specifically marketed to, North Americans. All onboard personnel are English-speaking. Typically, all guests will be from either the United States or Canada, sophisticated, well-traveled couples in the 50-ish+ age range. Vessels with a similar passenger capacity to Adrienne's are ideal for couples choosing to travel with friends, or even whole family groups. After all, it only takes six couples to fill the ship. Sharing a voyage with people you enjoy traveling with guarantees the conviviality of familiar friends and the company of companions with whom you share similar tastes and interests. The dress code aboard Adrienne is generally "country club casual." However, there are two meals for which passengers may -- and usually do -- opt to go dressy: the restaurant dinner at Auberge des Templiers and the captain's farewell dinner. Dressy, for most guests, would be described as "informal" on conventional ships (sport jackets and ties for men, the equivalent for women). The suggested amount to tip is approximately five percent of the total cost of the cruise, or about $200 - $250 per person. Though this may seem a high figure, it's reasonable considering the quality of service onboard, as well as the fact that there are no bar or shore excursion charges. Gratuities are paid in cash (either dollars or euros), inserted into an envelope and presented to the captain on the night of the farewell dinner. The ship does not accept credit cards.